Lawn fertilizing is a very complicated dance. You want the greenest, thickest, and most beautiful lawn, but it takes care to create the ideal turf. Test your soil to find the data needed for choosing fertilizer. If you are interested in organic treatments, you do have options but they may require a few extra steps when caring for your lawn. Weed control and insect infestations may be problems that you have to manage for your lawn’s health. To determine what kind of formulation you need when lawn fertilizing, have your soil tested. The University of Massachusetts has a soil and plant nutrient testing facility. It is a small investment, but worth it to determine the fertility level of your soil and which corrective measures you need to take (if any). Compost may be applied as a topdressing on your turf. Rotted manures are also a good fertilizer to spread on the grass. They can be applied yearly, but should be combined with bone meal and wood ash to make sure your lawn has a well-balanced fertilization plan. Leaving the clippings on the ground after you mow is a good way to add nutrients and reduce the amount of fertilizer you have to apply. Herbicides and insecticides are traditionally used for getting rid of weeds and insects that are trying to take over the lawn. 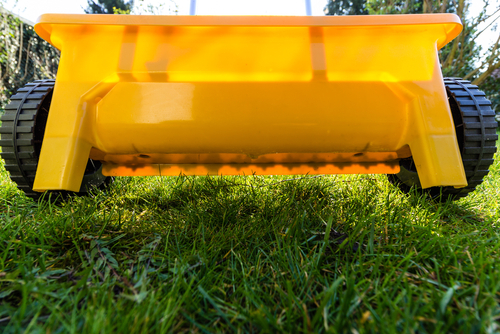 Making sure you seed well and have a thick lawn is one way to keep the weeds away from your turf. Some insects are beneficial to your lawn and help with breaking down organic matter and eating other insects. Insecticides can vary in their efficiency at eliminating pests. Some start working right away, while others start working in a few days.